The screenshot above is hosted and provided by codecrafters.com. Please contact them directly for any copyright infringement as we are not responsible for that content. Last Update: 2018-09-06 - Major Update: Updated SSL certificate private key length to 4096 bits. Updated OpenSSL back to version 1.0.2L to fix stability issues. Limitations: 30 Trial / Freeware mode with limited features after 30 day trial. License required to enable extra features. 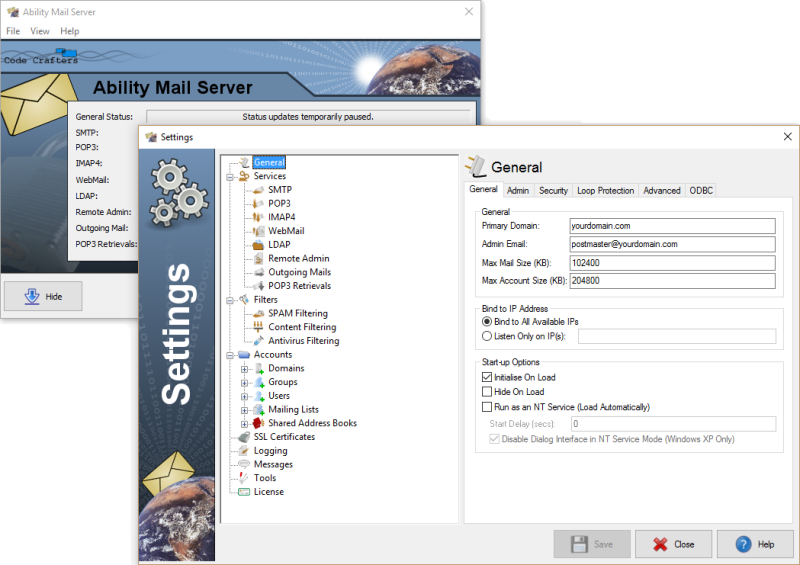 Ability Mail Server is an advanced, secure and high performing mail server. Featuring SMTP, POP3, IMAP4, WebMail, Remote Admin, LDAP, SSL, SPAM Filtering with Bayesian, RBL filters, SPF, Grey Listing, Black and White Listing, Antivirus Filtering, Content Filtering, POP3 retrievals, ODBC, mailing lists, static routing, domain administrators, aliases, redirections, auto-responses, user filtering, multiple folders, address books, IPv6 support, clustering and much more. Combines maximum functionality with ease of use.